Home > Science > Flags > African Countries Flags & Capitals > How Big Is Africa? Ok, we know it’s quite big, and its size in square miles/kms is no secret either. Kids will however have a much clearer idea of how big it is actually if they take a look at this image showing which countries and continents could basically fit in the map of Africa. This country is considered to be the oldest inhabited territory on Earth. As a continent it is the hottest place and ranks 2nd in size and population. It has 54 countries, an amazing climate ranging from tropical to subarctic, deserts, savannas, jungles and an incredibly rich biodiversity. 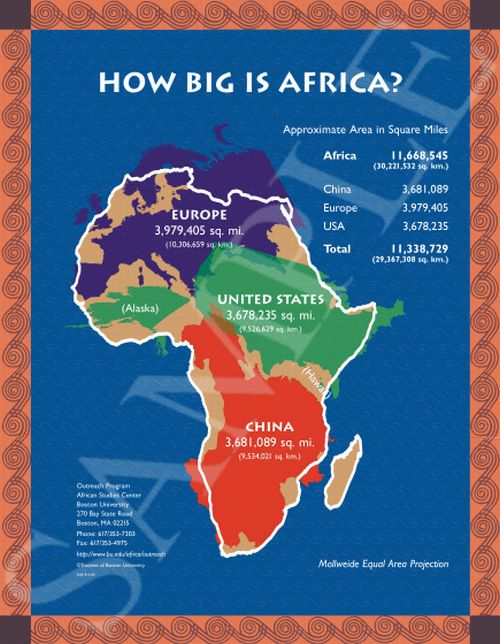 Use this great map with your students in your Africa lessons to help them imagine and have a better idea of how huge this continent is!